Black holes are long-time superstars of science fiction. But their Hollywood fame is a little strange given that no-one has ever actually seen one – at least, until now. 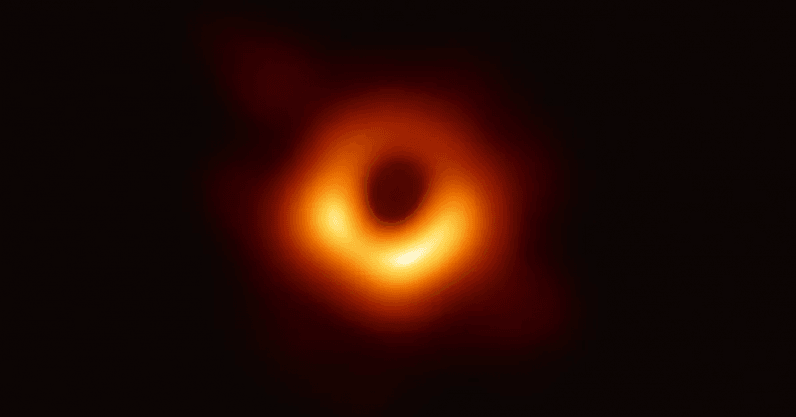 If you needed to see to believe, then thank the Event Horizon Telescope (EHT), which has just produced the first ever direct image of a black hole. This amazing feat required global collaboration to turn the Earth into one giant telescope and image an object thousands of trillions of kilometers away. Producing the image and analyzing such data is an amazingly hard task. As an astronomer who studies black holes in far away galaxies, I cannot usually even image a single star in those galaxies clearly, let alone see the black hole at their centers. The EHT team decided to target two of the closest supermassive black holes to us – both in the large elliptical shaped galaxy, M87, and in Sagittarius A*, at the center of our Milky Way. To give a sense of how hard this task is, while the Milky Way’s black hole has a mass of 4.1 million Suns and a diameter of 60 million kilometers, it is 250,614,750,218,665,392 kilometers away from Earth – that’s the equivalent of travelling from London to New York 45 trillion times. As noted by the EHT team, it is like being in New York and trying to count the dimples on a golf ball in Los Angeles, or imaging an orange on the moon. To photograph something so impossibly far away, the team needed a telescope as big as the Earth itself. In the absence of such a gargantuan machine, the EHT team connected together telescopes from around the planet, and combined their data. To capture an accurate image at such a distance, the telescopes needed to be stable, and their readings completely synchronized. With a sense of excitement, I watched the live stream showing the image of the black hole from the center of M87 for the first time. The measurements of the speeds of matter around the center of the black hole are consistent with being near the speed of light. From the image, the EHT scientists determined that the M87 black hole is 6.5 billion times the mass of the Sun and 40 billion km across – that’s larger than Neptune’s 200-year orbit of the sun. This piece has been updated to include a picture of Katie Bouman, a computer scientist who developed the algorithm that made the black hole photo possible. This article is republished from The Conversation by Kevin Pimbblet, Senior Lecturer in Physics, University of Hull under a Creative Commons license. Read the original article. Read next: TNW2019 Daily: Over 350 speakers confirmed!